Earlier today Porsche posted a new video featuring the career of Derek Bell and his relationship with Porsche. While we really enjoyed the video, and posted it for you below, we found a bit of an "easter egg" in Porche's description of the video on YouTube; a new micro-site featuring Porsche's return to Le Mans. Not to be confused with the Le Mans 24h at the limit microsite. 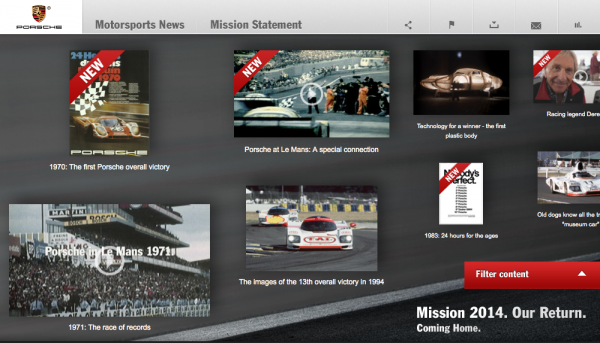 This new site revisits Porsche's 16 overall victories at this most famous of long distance races. Each week, new images, videos and factoids, will be posted as Porsche prepared for their return to Le Mans in 2014. Much of what will be posted on the microsite isn't available elsewhere so you might want to bookmark it and return often. I know I will! Historic Motorsport Head Klaus Bischof recounts that after winning Le Mans in 1976 and 1977, the 936 was retired to the Porsche museum before it was brought back for the 1981 race. He talks about the path back to Le Mans and the return of the 936 to the track for the first time since 1981 and the future of Porsche at Le Mans with real passion. A racer, a winner, a legend. Derek Bell started his Porsche career back in 1971. He has won the 24 hours of Le Mans four times and was not only part of the Porsche family - he still is. Why Attending the 12 Hours of Sebring is a Must for any Porsche Fan.